Caption slip reads: "Photographer: Glickman. Date: 1951-09-06. Reporter: Massard. Assignment: Marijuana in Van Nuys jail. 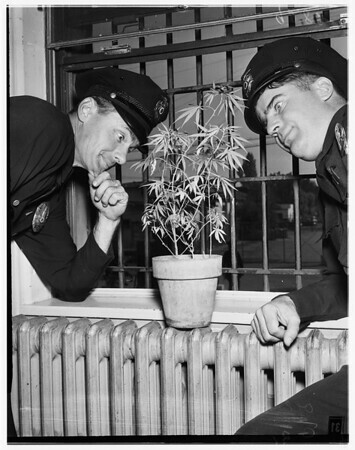 G31-32: Officer F.G. Plamonden gapes at blooming plant of Marijuana. Note bars in background. G13: l to r: Officers Ken Smith and Harry Kowalski wonder what goes on with the plant. Copsater found out that it was sent to Valley Div. to be in a lecture on narcotics. G14: Eyes wide open and wondering what marijuana plant is doing in police station is Officer Ken Smith".